I discovered at the young age of 12 the importance of having a good skin care regimen. That was the age when my hormones went into overdrive and I started getting pimples. Ugh. My mom taught me about taking care of my skin and instilled in me to always wash my face in the morning, but most importantly, before I go to bed. My oldest daughter is now 16 and thankfully has mostly clear skin. She does get the odd breakout here and there, but her skin is 10x better than mine when I was her age. She has a good skincare routine down pat and doesn’t need me to remind her about washing her face. Olivia recently added a new brand of skin care products to her beauty routine. 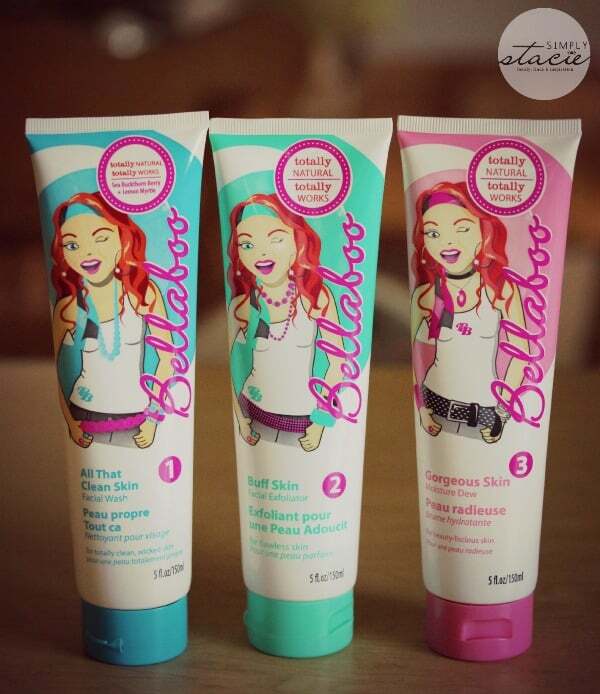 I’d never heard of Bellaboo until recently and was interested in seeing how she would like this skincare line made for teens and tweens. However, I need to mention that people of other ages can use it too. I’m 36 and used Olivia’s products and liked how they worked on my skin. What I like about Bellaboo products is that they are made with natural ingredients and don’t contain harsh chemicals that can irritate sensitive skin. Olivia’s skin, like mine, is sensitive and as her mom I much prefer her to use products that won’t irritate her skin. Bellaboo uses, wherever possible, ingredients sourced from plants, fruits, vegetables and minerals. Their philosophy is one that you should “feed your face” with healthy ingredients. Another important item worth noting is that Bellaboo products contain no parabens, petroleum, sulphates, artificial colours/fragrances nor are any ingredients animal derived. They also do not test on animals. They are a believer in the truth of labelling and follow international standards for cosmetic labelling. They even sent me a printout of all the ingredients used in their products and a description of what it is and what product I’ll find it in. I love that they are transparent! You can find the same list of all natural ingredients posted on their website. 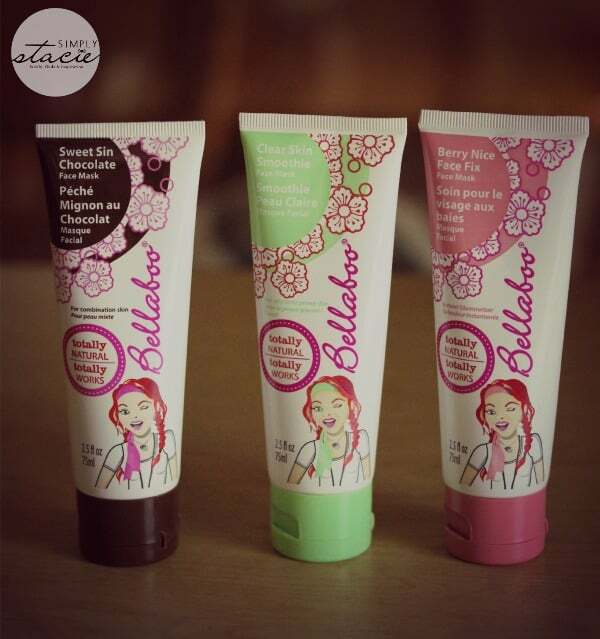 The starting point is clean skin and this 3 Step System from Bellaboo. As you can see the products are labelled in the order they are to be used. The first step is to cleanse the skin with All That Clean Skin Facial Wash. It gently removes all the dirt, grime, makeup that builds up on the skin and keeps it healthy. It contains botanicals that fight bacteria and keep skin looking and feeling fresh! Olivia said she likes it because it doesn’t make her skin feel dry or tight. I tried it on my oily skin and liked that it got rid of the extreme shine and didn’t irritate my sensitive skin. Step two is exfoliation with Buff Skin Facial Exfoliator. This product uses micro-particles of finely ground Indian Bamboo extract + Rice Bran powder to buff off the dead skin. My esthetician drilled into me the importance of exfoliating skin months ago and made me promise I would do it. She said it helps to keep pores open and that I should have less breakouts this way. 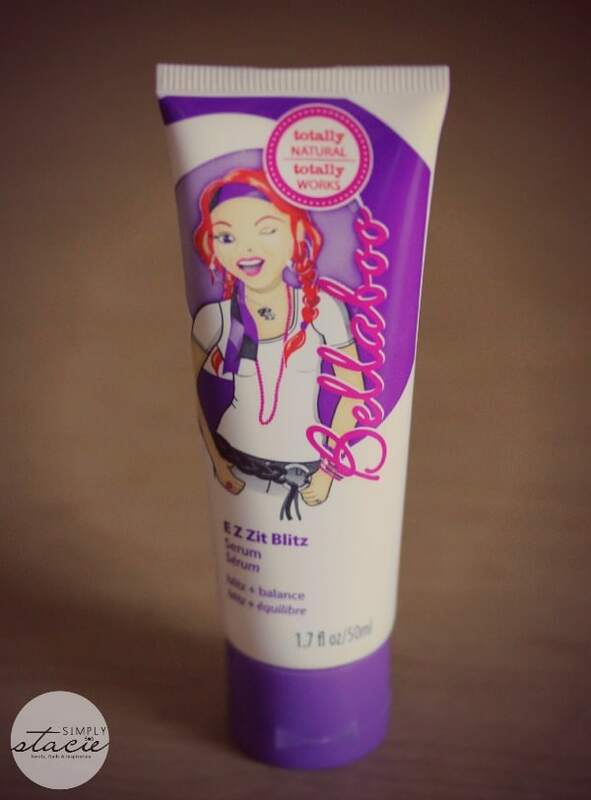 I’m glad to see that Bellaboo has an exfoliator in their skincare kit for teens. It will help get Olivia used to exfoliating on a regular basis. The recommendation for girls her age is to exfoliate two to three times a week. Tweens won’t have to do it as much – only once a week. I like that Buff Skin Facial Exfoliator doesn’t make my face look like a lobster after using it. Even though I know exfoliating helps, my face gets red after doing it and it can sometimes be a little painful. I learned that the larger the particle the worse it is for your skin because they will overstimulate the skin. That’s why super fine exfoliants like this one from Bellaboo will not irritate skin. The third step is Gorgeous Skin Moisture Dew which is your moisturizer. It’s applied after cleansing or exfoliating and works on all skin types. It’s lightweight and absorbs quickly. Olivia wasn’t using moisturizer before so it’s new to her. She said she liked that it makes her skin feel soft. I tried it on my oily skin and liked that it absorbed quickly and didn’t leave a greasy residue. Too often I avoid moisturizer myself because my skin is so oily. I know it’s important to use no matter what type of skin you have. You just need to use one that is right for your skin! You can purchase all three products in a Starter Kit for a sale price of $34.95 (regularly $49.99) or individually for $12.95 each. Bellaboo also has face masks that nourish the skin and help to detox old skin cells. I remember using face masks with my girlfriends at slumber parties! We’d all give each other facials and then sit around chatting with our faces full of mud. I’d have much rather used the Bellaboo masks. They have a Sweet Sin Chocolate Face Mask, Berry Nice Face Mask and Clear Skin Smoothie Face Mask. Olivia’s favourite is the chocolate mask (no surprise there!). It’s a different way to get a chocolate fix. She said her skin feels “awesome” after using it and has been using it on her face about once a week. She said her skin tingles a little when using it, but I learned that is normal and is just the active ingredient in the product working it’s magic. This is Olivia’s favourite product of the bunch! The masks can be purchased for $9.95 each. Even with healthy skin, breakouts do happen. Stress and hormones are triggers and Olivia is prepared with Bellaboo’s E Z Zit Blitz Serum. The Bellaboo formula won’t dry out the skin like traditional acne spot treatments can. Instead, they work to re-balance the skin and heal the blemish without skin irritation. Olivia doesn’t have any pimples (knock on wood) so I tried it on one of my breakouts. It didn’t burn or bother my skin. Within a few days, the zit was history. I’ll be snagging this from her again soon. You can pick up this product for $14.95 on the Bellaboo site. I’m happy that Olivia has a good skin care routine now and is enjoying using Bellaboo products. Visit Bellaboo to learn more about their products and to purchase! I want to try the Sweet Sin chocolate face mask. I would love to try the Berry Nice Face Fix Mask. I like the smoothie face mask. I would love to try the bellaboo 3 step system. I used to use clinique’s 3 step system.. but it’s expensive and I’m looking for something good and new. I’d love to try this out. I would love to try the All-That Clean Skin Facial Wash! There Buff Skin – Facial Exfoliator looks very interesting. I would love to try the smoothie face mask. im most interested in the Sweet Sin Chocolate Face Mask. Buff Skin – Facial Exfoliator would be my first purchase. Thanks for the chance to win this. I am most interested in the Gorgeous Skin Moisturise Dew. I’m really interested in the Buff Skin – Facial Exfoliator! Buff Skin – Facial Exfoliator. My poor teen! E Z Zit Blitz Serum for us! Would love to try the Gorgeous Skin Moisture Dew. I think Im most interested in the Clear Skin Smoothie Face Mask!! Im always looking for natural products!! These sound great!! Thank you for the chance!! My wife would love to try the Sweet Sin Chocolate Face Mask. I’m most interested in Gorgeous Skin Moisture Dew. I would like to try the 3 Step Natural Skin Care System in a pack. Thanks for having this contest. I would like to try the Bellaboo starter kit, it’s nice to see how the main effects of the product line works on my skin. Buff Skin- Facial Exfoliator, looks awesome.